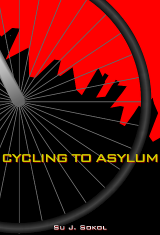 Cycling to Asylum, my first novel, to be published in June! In a near-future New York subject to an increasingly authoritarian and hostile government, Laek, a non-conformist history teacher, finds that he can no longer hide his radical past. After a brutal confrontation with the NYPD, he flees the United States with Janie, an activist lawyer, and their two kids, Siri and Simon. They cross the border by bicycle into Québec by posing as eco-tourists. In a Montréal that the future has also transformed, the family faces new challenges: convincing the authorities to grant them refugee status and integrating into Québec society. Will they find safety in their new home? Told from the points of view of the four family members, Cycling to Asylum is an unique work of interstitial fiction from an exciting new Montreal author. The book launch has been scheduled for Thursday evening, June 19th, at 7:00 at Drawn & Quarterly, a fabulous venue in Montréal’s own Mile End. Please click here for event details. I will also be participating in a collective reading during The Magical Evening with Canadian Authors (MECA), on Saturday, June 14th. Details are here. Stay tuned for news of other related events, hopefully including a New York launch of the novel as well!